We carry leather insoles, as well as sport, odor-eliminating, arch-support and fleece insoles. We also carry pads for the front of women's shoes for under the ball of the foot, to prevent the foot from sliding forward in the shoe, and other comfort accessories to eliminate foot pain. 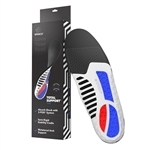 Foundation Super Comfort Poron flat insoles are made with genuine Rogers Poron to provide you with the ultimate long wear and shock absorption. The Microban top cover provides anti-microbial and anti-fungal protection. Step after step, the insoles rebound to provide you with long wearing cushioned comfort. A low profile design provides a better shoe fit. Foundation super comfort poron flat insoles can be used in athletic, casual, work and even dress footwear. Foundation Leather comfort Insoles combine a genuine naturally tanned leather top cover with a European engineered foam for maximum comfort and fit. Genuine leather provides a cool and comfortable environment in your shoe by naturally wicking away moisture and conturing to your feet. European engineered memory foam adds an additional layer of conturing and shock absorption. A trim profile delivers maximum comfort in a great fitting insole. For use in most types of footwear, including slim fitting shoes. Foundation Memory Comfort Flat Insoles combine a micro-suede soft top cover with a cushioning latex Memory Foam base for superior comfort. Shock absorbing Memory Foam base naturally conforms to your foot for customized comfort. Plush micro-suede is soft and comfortable against the foot and helps maintain a dry environment. The slim design and lightweight cushioning fits in all types of footwear, even in "sock-less" style shoes. Tacco leather shoe insoles feature a genuine leather top for comfort and moisture absorption. Activated carbon filter bottom helps prevent foot odor. Shapes to foot. Will not shrink. 1 pair. Available in men's and women's sizes. These Tacco leather insoles run on the small size. It is recommended that you go up a full size when ordering. Tacco Luxus is a long insole with a surface made of ecologically tanned sheepskin and a soft RelaxFlex layer. An integrated active carbon odor absorber prevents foot odor effectively. Tacco Luxus is very thin and fits into every shoe. If you are a half size, go up to the next size. Tacco Sheepskin shoe insoles feature a genuine sheepskin top for comfort and moisture absorption. Activated carbon filter bottom helps prevent foot odor. Shapes to foot. Will not shrink. 1 pair. Available in men's and women's sizes. These Tacco insoles run on the small size. It is recommended that you go up a full size when ordering. Thermal Fleece Shoe Insoles keep your feet cozy and warm in the soft comfort of fleece. Helps keep the cold and dampness out. Fits virtually all footwear. 1 pair. Available in men's and women's sizes. 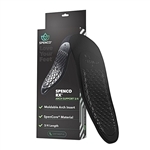 Spenco PolySorb Walker/Runner Insoles. Contoured heel cup and arch support cushions and supports your feet. Special heel strike provides maximum cushioning at heel strike when walking, running and jogging. Absorbs shock and supports the arch and heel. Helps reduce friction and heat build-up that cause blisters and calluses. These durable and washable insoles prolong the life of your shoes. 1 pair. Available in men's and women's sizes. Spenco Rx OrthoticArch Full-Length Orthotic Arch Supports are designed to support medium to high arches without adjustment. They cushion impact and reduce friction to help prevent blisters.The green SpenCore pad provides heel-to-toe cushioning. The moldable orthotic cradle improves balance and stability. Finally, the low-friction top cloth helps prevent splinters. Accepted by the Podiatric Medical Association. One pair per package. Available in men's and women's sizes. Foundation Support Orthotics's semi-rigid arch design supports the heel and the arch. Cushioning rebound foam mid layer provides all day comfort. Plantar Fasciitis, Heel Pain Syndrome and biomechanical issues often present as foot, heel, and lower extremity pain. * To treat properly, many medical professionals recommend supportive orthotics. Spenco Rx ThinSole Orthotic Arch Supports help relieve arch pain, improve gait, balance and stability. These insoles are shaped to help stabilize and balance the foot to help prevent pronation and suppination. Absorbs shock and reduces friction to help prevent blisters. The moldable Ultra-thin Orthotic cradle minimizes foot motion, while the SpenCore layer cushions impact. The 3/4 length is great for tighter fitting shoes. Durable and washable. 1 pair. Available in men's and women's sizes. Wool Felt Shoe Insoles keep feet warm and dry. The wool felt insulates your feet from the cold to keep them warm, while the extra thickness of the insoles absorbs moisture to keep feet dry. They are comfortable and durable, and ideal for cold-weather activities. Can be used in boots and work shoes of all kinds. Can be trimmed. 1 pair per package. Available in men's sizes 7-14. Frankford Super Comfort Insoles have a contoured arch to support your feet. They provide maximum cushioning and shock absorption. The heel cup provides stability, and a soft touch top cover adds to total foot comfort. Great for casual, athletic and work shoes. 1 pair per package. Available in men's and women's sizes. Made in USA. Frankford Diabetic Comfort Insoles are specifically designed for individuals with diabetes or arthritic conditions to provide comfort and protection. They are light-weight, absorb shock and conform to your feet to accommodate areas of pressure. The contour design supports the arch. 1 pair. Available in Women's sizes 6-10 and Men's sizes 7-14. Tacco Nova Arch Support Inserts are made of an ErgoDyn insole foot-bed with RelaxFlex function, which provides flexibility and comfort. A second layer supports the metatarsal arch and provides relaxation of muscles, tendons and ligaments. Prevent foot fatigue by adding these inserts into men's and women's shoes. The surface is made of ecologically refined sheepskin. Self-adhesive, fits easily in any shoe. 1 pair per package. Available in Men's sizes 7-14 and Women's sizes 5-10. Moneysworth & Best In-Step Insoles are perfect for high heel, flat and open-toed women's shoes. They are 3/4 length and ultra slim, so they won't show in open-toed shoes and sandals. Makes shoes more comfortable, while providing superior moisture absorption and hygienic anti-bacterial protection. One size fits all. Self-adhesive. One pair per package. Pink Only Premier Oder Stoppers are great for comfort and stopping odors. They destroy foot odor, absorb moisture, cool burning feet and are washable. These insoles are easily cut by a pair of scissors, so if you do not see your size, just order the next size up. Tacco Deluxe Insoles provide metatarsal arch support, while relaxing the muscles, tendons and ligaments. The ErgoDyn insole footbed provides a reflex function that provides comfort to every step. There is also a ShokAbsorber point in the sole that absorbs shock and cushions the sole. An activated carbon odor absorber prevents foot odor. The breathable surface is made of ecologically refined sheepskin. 1 pair. Available in Men's sizes 8-14 and Women's sizes 5-10. Tacco Polar is a snuggy warm long insole of fleecy lambswool with a breathable RelaxFlex functional layer. Tacco Polar ensures warm feet in cold weather. Comes in Men's or Women's sizes. Tacco "Woody" Insoles are multi-layered latex foam insoles with a cloth cover and contain an antibacterial agent. They are also lightly scented to keep shoes and feet smelling fresh. In addition to providing cushioning and adding comfort to every step, they also absorb moisture. Perfect for sneakers and casual shoes. 1 pair per package. Can be trimmed to fit. Available in Mens and Womens sizes. Foundation Leather Comfort dress orthotics combine a genuine naturally tanned leather topcover, European engineered memory foam and a supportive anatomical shell for unmatched support, comfort, and fit. All the benefits of full length orthotics in a compact 3/4 design. Heel and metatarsal pads for extra cushioning and support. Fits most types of footwear, including slim fitting shoes. Helps to ensure that your body weight and the forces upon your feet are equally distributed to avoid excess pressure to the parts up the chain, including ankles, knees, hips and spine.